Have no fear of loosing power to your mobile phone anymore - fashion gurus look away now. As funny as it looks, this little thing will harvest energy of your lunch and transform it into electric energy for charging your phone. It is a very simple solution though - hollow out your shoe, left or right and stick in a generator from a generator-flashlight. 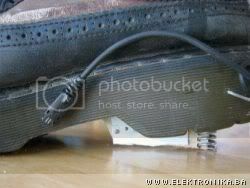 There are actually two generators in a shoe with an addition of a spring to push the lever to the starting position. After that, just solder the appropriate charging cable for your phone and off you go! It is capable of generating enough power to charge a phone or iPOD while you walk. Pretty nice thing!